I am so grateful for all of my wonderful customers. It’s been so great working with all of you. I especially appreciate my repeat customers!! As a thank you, 50 printed cards are up for grabs! 1. Head over to my shop. 2. Come back and comment on this post, let me know what your favorite design is. 3. Want an extra chance to win? Like Nounces Design on Facebook. Already like us on Facebook? Update your status and tag Nounces letting your friends know of the giveaway. 4. Make sure you post a second comment letting know that you like Nounces Design on Facebook. Winner will be chosen randomly 11/29. Love the Ho, ho, ho design! I’ve liked you on facebook for a long time! I love all the custom ones — especially that one what the pictures of the cats in it! 🙂 Can’t wait to pick out a design for this year! Merry Christmas and Happy New Year Zebra Print Photo Card! I like the custom designs also. Or anything you have ever done with your children and last year with William, I loved that so much!!! Let’s face it Jenn, you are the best at this ever!!! 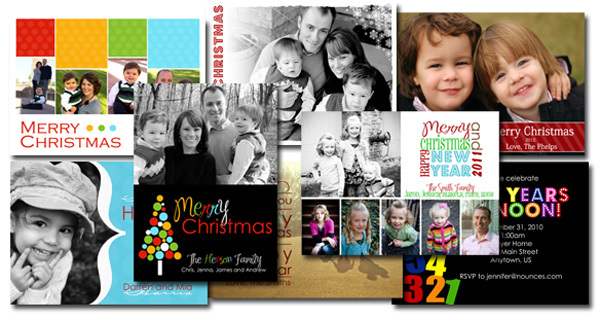 My favorite design is Merry Christmas and Happy New Year Zebra Print Photo Card! I love the Christmas Photo Card – Printable Merry Christmas and Happy New Year Zebra Print Photo Card. I’m your fan on Facebook (Amy Hill). Of course my favorite is our custom card from 2007….can’t believe our 2010 card didn’t make the cut. Can’t wait for 2011 cards!! I SO love the Merry and Happy holiday card!, but it’s so hard to choose. Thanks for doing this giveaway. I have several of your designs in my favorite list. I follow you on FB and reposted the givaway whilst tagging your page. i love the Johnson one… didn’t see that one the other day. my favorite is the Merry Everything! Love the merry everything card I bought today! Thanks for customizing it for me!!! I love the merry and happy new year card! !